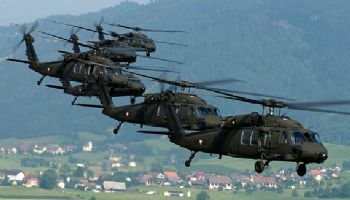 Yesterday about 6 pm 4 Blackhawk Helicopters flew over our home heading East. We think we they were headed to the base in Victorville. Today, also around 6 pm, they flew back (West) probably to their home base. There are 3 bases West of us, that we know of. Might be more. I could hear the Helicopters coming, and looked at my Hubby. "There is more then 1". We walked outside, and this is what it sounded like. that is always cool to see Thanks Jeanne. Must have been really cool! Very cool. Glad you got to see it. Enjoy the fun of watching for all the photo opps there! We get a lot of jets and Helicopters from and big base up in SD. They give me a feeling of peace. Woohoo! Awesome you two got to see them. I used to live near the Naval base in Dartmouth, Nova Scotia, and loved to watch the planes. I even went out with a helicopter mechanic for a while. Awesome group. We do have helicopters flying over us 4-5 times a week with the Border Control. What an amazing sight! It gives you a warm feeling that you're protected doesn't it?